Firstly, from other cheapflights domains, like cheapflights.com – the United States version of the website. There is nothing wrong with this at all. Both sites leverage off each others linking success and credibility. Simply buying domains and redirecting them to your site isn’t enough. They need to have their own credibility as a domain before their links ‘mean’ anything. Building mini-sites around your niche solely for the purpose of linking into your site is probably a really effective link building strategy for building the credibility of your main website. ** Pick a really niche keyword that perhaps wouldn’t warrant an entire website and wouldn’t perform its best within in your site (don’t copy any pages on your website – Google hates duplicate content). Buy a related domain and generate a mini-site, spend a little amount of time marketing and building its own credibility and there you have it – credible links galore! Your mini-sites should be incredibly low maintenance. They shouldn’t detract from your overall efforts on your own website and should effectively run on ‘autopilot’. Second, notice the high number of links from news sources. 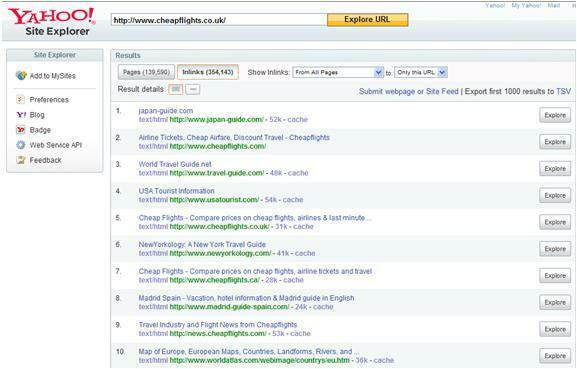 Pretty odd; people don’t go to cheapflights.co.uk to get news - check out the Alexa ranking info. News is a commodity and is highly prized if it is unique, first-to-press and is a popular or in demand topic. Cheapflights.co.uk news section is solely to attract links. If cheapflights.co.uk can be the first to get information on train strikes or whatever, then other webmasters will be more likely to reference it (and thereby link to it). This builds up a web (no pun intended...) of links from related sites which builds massive credibility. Notice that the news page goes to news.cheapflights.co.uk, as opposed to a potential cheapflights.co.uk/news – this improves the relevancy of the top level domain, as opposed to having numerous links go to news pages which are completely separate from the websites core ‘search’ function. By consistently providing up-to-date news to other webmasters in their field, they can seed viral-linking within their own niche. This also leads the big media players such as the Daily Telegraph to link to them. Provide in demand content which humans have a strong interest in. Whether humans actually visit it or not is besides the point in the case of link-building. You want in-pointing links from related websites, building your credibility and search engines overall picture of your website. Search engines will also measure visitor satisfaction in determining how credible a website is. If you’ve got a loyal base of returning visitors, then obviously those visitors find some value in the website. This echoes the ‘human judgement factor’ that link-building is all about. How does cheapflights.co.uk do this? The weekly newsletter. A newsletter simply allows you to capture an email address – a contact, who you can a) market your services to and b) demonstrate credibility to the search engines that you have a returning visitor base. Aside from newsletters, there are many ways of attracting a loyal visitor base such as a Blog with RSS feed to people’s Homepages (iGoogle, My Yahoo etc.). A blog would lend itself to a content website where the content is written more specifically for the visitors. In the case of cheapflights.co.uk, the latest news updates may be useful to some – but as I say, people don’t search and arrive at cheapflights.co.uk for the latest news; it’s merely an effective link building strategy. The third category is the ‘travel guide’ category. Getting links from websites whose own purpose is to promote a destination is important, since people need “cheap flights” to get to those destinations. These links add value because that specific travel guide recommends them, and they are both in the same field – travel. Nothing more can really be said – an effective link building strategy will involved building links with related, but non-competing websites adds extraordinary value to your website. A links exchange is commonly the best way to do this – read more about my tips for a links exchange.